We’ve had so many enquiries for weddings in the last few months; April and May must be the months to get married… but we’ve noticed a trend lately and have crowned the Gerbera, Gerbera Daisy or Barberton Daisy, The New Rose! This simple yet elegant flower is versatile, long lasting and modern. And the good news for a lot of brides on a tight budget is that they are a more affordable choice for wedding flowers than white roses or lilies. You will find this family of the sunflower in all the colours of the rainbow and like the sunflower; Gerbera Daisies symbolize happiness, joy, beauty and wonder. Combine bright orange and yellow with royal blue and rich purple for your medieval wedding, or add a touch of bright pink for an elegant wedding or garden wedding. 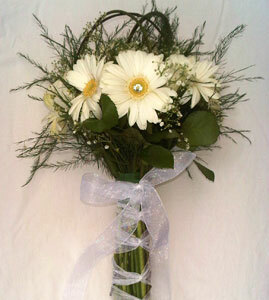 Or for your fairytale wedding use white gerberas which symbolize innocence, purity and love with a touch of baby pink or pale yellow. A bunch of gerberas with a few roses and greenery, or even on their own tied with organza ribbon, maybe add a sparkle or a little bling with a gemstone pin in the centre, and you have a gorgeous bridal bouquet. Since Gerberas come in different sizes; large, medium and small, they can easily be used as button holes, pomanders (ball of flowers) for flower girls, brides maids, pews and at the back of your chairs or on a napkin ring at the reception. 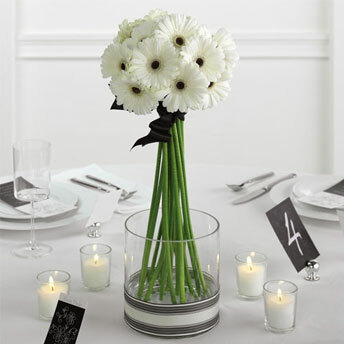 If you are on a really tight budget, DIY Weddings Magazine have a great article on how to create your own Gerbera Daisy Centerpiece, or read our wedding flower guide if you need help planning your wedding flowers. There you have it girls, just because you want simple wedding flowers or you have a tight budget, doesn’t mean you have to have something less WOW than more expensive wedding flowers! BTW: If you are looking for a wedding florist in Durban, South Africa, please feel free to get in touch with us. 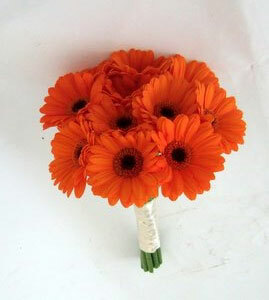 I think Gerbera’s are a great idea as they are such bright happy flowers and are amongst my favourite flowers. We couldn’t agree more Diane. Thanks for your comment. Great article! 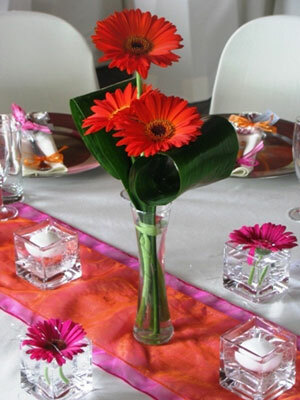 Gerbera’s are like a party in a vase!!! Love them and love preserving them! Thanks for your comment and for sharing our article with your readers. Gerbers are great flowers. Since they are native to South Africa they are easy to grow in your region with minimal or no pesticides. In other countries with different climates, such as the United States and Europe they are difficult to grow without lots of pesticides. Thrips, mites and aphids love gerbers too. Brides sensitive to environmental issues need to be aware of this and pay attention to sources. Buying local, sustainably grown flowers is a great way to get flowers with fewer pesticides. Look for a local grower in your area and talk to them about their growing methods. Having beautiful, pesticide free gerbers for your wedding is worth the extra time it takes to find a great local grower who cares about the environment and her customers. Kate, thank you so much for your comment and valuable insights into the intricacies of Gerberas. Being based in South Africa ourselves, we didn’t realize that buying Gerbera’s overseas could be so tricky. I am sure our readers, especially those in the USA and Europe will find your advice hugely beneficial, just as we did. One flower in particular has always caught my eye, the gorgeous Gerbera daisy. This delightful beauty comes in a variety of colors that include white, hot pink, dark red, orange and yellow to name just a few… Thanks for great post Florist Chronicles! Thanks for your comment Wedding Flowers. We are glad you liked the article. The vast range of beautiful colours are definitely one of the Gerbera Daisies best characteristics, and this certainly makes for interesting flower displays for any occasion. I love Gerbera Daisies!! They add a great pop of color and texture and they’re affordable! Perfect for weddings Love it! Great piece. We’ve noticed a definite shift toward the more simple, and less expensive flowers in the last five years or so, and Gerbera Daisies are tops on the list. 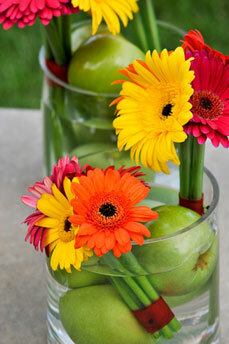 “Gerberas are such wonderful and vibrant colours” great article. I must disagree regarding the cost of Gerbera Daisies. In the USA, if you want a specific Gerbera -you know, just that right shade of pink to work with the ribbon that the Bride must have- you need to buy probably in multiples of 50 (if ex California and probably a higher multiple/box quantity if from the Dutch auctions or from Israel) and the price per stem IS noticeably higher than a white rose stem, whether from S. America or a grower such as Eufloria in California, such as Vendella or Mount Everest. Oriental lilies might be more cost effective than gerberas, depending upon the time of year and the fact that a single stem of a good oriental white such as Casablanca should give you 2 decent, large, blooms and possibly 3 and, if lucky, 4. Gerberas are also prone to being “difficult” and even the best of florists can have problems with them as it all depends upon how well they have been treated and looked after from harvesting to arrival at the florist. Thanks for your comment Simon! It’s true that prices vary all over the world, depending on where your flowers come from. In South Africa, where the author’s floral shop is located, Gerberas are relatively affordable (After all, that is where the Gerbera or Barberton Daisy was discovered and first grown). From some of the comments above, it seems other florists would agree, but you make a good point that in other parts of the world, the prices may vary. Thanks for bringing this to our attention, and adding value to this discussion. Thanks Claire. Glad you like it. We really love your website btw. It is very clean and elegant!